Report reaching DAILY POST has it that Hon. James Ocholi SAN, the Minister of State for Labour just had a fatal accident about 40 kilometres away from Kaduna, on his way to Abuja. According to the report, Ocholi reportedly died on the spot. 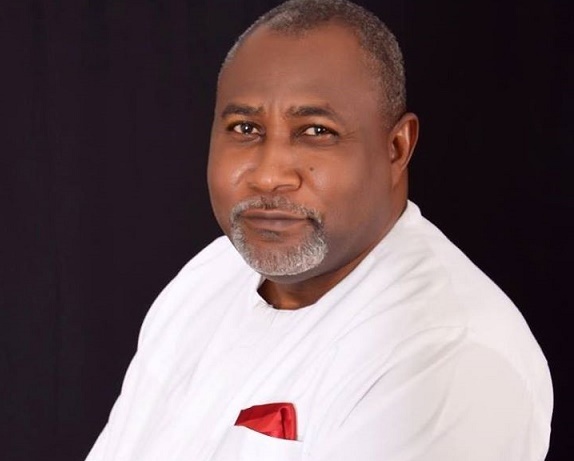 The accident claimed Ocholi, a Senior Advocate of Nigeria from Kogi State, and his son. Those familiar with the ugly incident said his wife just passed on at Doka Hospital after sustaining head injury from the fatal accident. It was gathered that the accident occurred after the minister’s car had a burst tyre before somersaulting several times. Meanwhile, the driver is said to be in critical condition at Doka clinic, several kilometres from Kaduna. However, his wife also died at Doka Government Hospital in Kaduna hours later. The Kaduna State Sector Commander of the FRSC, Mr. Francis Udoma, explained that the accident occurred when the rear tyre of the Sports Utility Vehicle conveying them burst and the vehicle summersaulted several times. Udoma said, “The rear tyre bursted and the vehicle, summersaulted. The minister and his son died on the spot, the wife died in the government hospital in Doka, Kaduna. President Muhammadu Buhari has expressed shock and sadness at the death of Barrister James Ocholi (SAN), who together with his wife and son were killed in a car crash in Abuja on 6 March, 2016. President Buhari described the Minister of State for Labour’s death as untimely, regretting that Nigeria has lost a key component of the CHANGE agenda. “Barrister Ocholi was an accomplished and patriotic Nigerian, who was keen to accept the call to service at a time his country needed him,” President Buhari said, adding that in the few months he had been in office, the late minister of state had already begun to distinguish himself through his commitment and dedication to his portfolio. The late Ocholi has had a long record of political association with President Buhari. President Buhari also consoled with the government and people of Kogi State, whom he described as having lost a distinguished and irreplaceable son. He prayed that God would comfort them and grant them the grace to bear the loss. “The entire country mourns the loss of this great man, who has sadly left us when we need him most,” he said. President Buhari has also sent the Secretary to the Government of the Federation, Engineer David Babachir to formally convey the news to members of the deceased family as well as parishioners in his place of worship. Two of the suspects that kidnapped three students of Barbington Macaulay Junior Seminary School while demanding a 60 million naira ransom have been arrested. Other suspects also arrested were the two persons who registered SIM cards used in contacting the girls’ parents for the suspects. One of the kidnap suspects, Emmanuel Arigidi, said the group did not molest or abuse the girls, adding that they approached the school and escaped via canoes at the edge of Adama creeks on the fateful day of the the ugly incident. Gunmen have beheaded a chieftain of the All Progressives Congress in Omoku, Ogba/Egbema/Ndoni Local Government Area of Rivers State. The APC chieftain identified as Franklin Obi was murdered alongside his wife, Iheoma, and 18-year-old son, Bestman, at their residence in Omoku at about 9pm on Saturday. The State Commissioner of Police, Mr. Musa Kimo, who is currently on a visit to the place, expressed regret over the incident. Anambra State Governor, Willie Obiano, has announced a partnership with the United States in the four key areas of his development plan for the state. The Governor made the announcement on Saturday after a closed door meeting with the United States Consular General in Lagos, John Bray, at the Governor’s Lodge, Amawbia. The key sectors include: Agriculture, trade and commerce, oil and gas, and industrialisation. Governor Obiano said that waste management and education would also be taken into perspective. He noted that another meeting had been scheduled where the two parties would study carefully the proposed details of collaboration that would accelerate the development of the state. The Consular General commended the Governor for the increased security arrangement in the state which he said would guarantee the safety of residents and visitors. Mr Bray also commended the impressive road network which he said could not be found in several other states. He, however, said the visit was a fact finding one in which the information gathered would be taken home for processing. President Muhammadu Buhari during his last visit to Qatar has given the interview to Al Jazeera. The Nigerian president has been speaking about the challenges the country is facing now, comprising the naira devaluation, the Boko Haram, anti-corruption crusade, the Biafra issue. Buhari is seeking support for his fight against corruption and to promote much-needed investment in his country’s ailing economy. Qatar is the actual president of Organization of the Petroleum Exporting Countries (OPEC) and Nigeria is Africa’s largest oil producer. The low oil prices have a destroying influence on the Nigerian economy, which has long depended on the export of oil. On naira devaluation, the Nigerian leader of the nation said he would not reconsider his insistence on freezing the currency. President Buhari said as Nigeria “virtually imports everything, from rice to toothpicks”, it cannot afford to devalue its currency. “If it is against our national interest, why can’t we go against the IMF advice? ” Buhari asks. Two major Buhari’s promises during the election campaign last year were to eradicate corruption and end the Boko Haram insurgency. However, the Boko Haram remains active in many areas of Nigeria, seemingly able to strike at will. The declaration of the Independent Republic of Biafra in 1967 caused a civil war that resulted in the death of millions and the re-annexation of the republic to Nigeria in 1970.
separation of the Biafran territories is against the constitution. AHEAD of the March 19 rerun elections in Rivers State, Governor Nyesom Wike has raised the alarm that the opposition All Progressives Congress was planning to impeach him through the State House of Assembly. Wike said the APC plans to win the forthcoming legislative rerun in order to get the majority in the state House of Assembly and subsequently remove him as governor. The governor further alleged that part of the opposition party’s plot was to use security agents to intimidate and arrest top members of the Peoples Democratic Party and government functionaries to pave way for rigging during the election. Wike, who spoke during a phone-in programme at a Port Harcourt-based radio station on Saturday, vowed not to fold his hands and watch the harassment and arrest of PDP members by security agents. The governor also said the he would be involved in the March 19 exercise and would not allow anybody to rig the state and National Assembly election. The governor had earlier directed all PDP leaders, council chairmen and government functionaries to resist arrest by security agents based on trumped-up charges. He said, “They (APC) want to win all the House of Assembly seats that are declared for rerun so that they can impeach me. They want me to fold my hands because I am a governor? Nobody does that. I am not a governor that will not just sit in his office. President Muhammadu Buhari has confirmed Nigeria’s membership of the Islamic Coalition Against Terrorism, being spearheaded by Saudi Arabia, amidst speculations of the alleged plan to islamise the country. The President made the disclosure in an interview he granted Al-Jazeera during his recent visit to Doha, Qatar, while the interview was aired on Saturday. When asked whether Nigeria was part of the Islamic coalition, Buhari answered in the affirmative. He attributed the reason behind the decision to the fact that there are terrorists in Nigeria who claim to be Muslims. “We are part of it (the Islamic coalition) because we’ve got terrorists in Nigeria that everybody knows which claim that they are Islamic. “So, if there is an Islamic coalition to fight terrorism, Nigeria will be part of it because we are casualties of Islamic terrorism,” the President said. Buhari said he discussed Nigeria’s membership of the coalition with King Salman Bin Abdul-Aziz during their meeting in Riyadh, Saudi Arabia, when he visited the country recently. He however did not disclose how the membership of the Islamic coalition would be beneficial to Nigeria, when asked to do so. He said it would be wrong to disclose the details to the media. Lagos—Chairman of the Hausa traders at Mile 12 market, Alhaji Haruna Muhammed hs appealed to Lagos State chapter of the Arewa Consultative Forum, ACF, to prevail on the state government to re-open the market, disclosing that perishable goods worth more than N500 million was lost to the closure. He clarified that traders at the market had no hand in the mayhem. According to him; “Mile-12 market was not part of the clash. While the clash was going on, we were going about our trading. We appeal to Arewa Forum to help us talk to Lagos State Government to re-open the market. ‘’As I speak, hundreds of trailer loads of perishable foodstuffs are waiting on the Ibadan Express-way. This is as the Lagos State chapter of the Arewa Consultative Forum, ACF, has spoken on the need for the Hausa community and other residents in Mile 12 area of Lagos to live in peace with one another. Chairman of the forum, Alhaji Aminu Dogara, who led some officials to Mile 12 following last Wednesday’s clash, which resulted in the loss of lives and wanton destruction of property, described the incident as unfortunate, stating that the market was meant for all Nigerians, irrespective of tribe or religious affiliation. Popular musician, Wizkid’s off and on Girlfriend, Tania Omotayo has a funny way of dispelling pregnancy rumours Share on Facebook Share on Twitter Tania Omotayo Tania Omotayo Wizkid’s girlfriend, Tania, who has reportedly ended the relationship with the singer, over the alleged babymama drama the musician has recently been named in, shared a post on Instagram, and one of her followers called her out. Here’s a screenshot of the picture below: Share on Facebook Share on Twitter Tania The follower, @marveleuphoria thought she looked pregnant and promptly asked, a question to which Tania instantly replied to, with a hilarious answer. Here’s what Tania said: “@marveleuphoria somebody cannot eat in peace again? Well maybe sha pregnant with amala and ewedu ?” Here’s a screenshot of the exchange below: Share on Facebook Share on Twitter Tania Do you think Wizkid has scored another goal? Well……City People magazine recently caught up with Dele Momodu and here are excerpts from their chat. You won’t believe that I just saw the video for the first time less than 2weeks ago. I saw the thriller for few seconds before that but I never bothered to go out of my way to watch it as I actually thought he was abusing me and I expected him to abuse me but when someone is like your son, you just have to let it past. Whether we like it or not, we are like family. His Dad and I have known each other like forever. The devil is a liar, when good things are happening, the devil will want to come in between it and all. I saw it on-line first as people were tweeting about it and I initially said, well, he is abusing me, no problem. You know several times in the past, he will attack me and apologize. I understand how he feels, he feels I am supporting my cousin against him and that is not it. All I wanted was just peace and I am happy we got it. The popular & highly controversial TV host, Vlogger and OAP, Toke Makinwa took to instagram this morning to say she is single and needs a guy. This doesn’t come as a surprise since her marriage has been hippitty hop ever since her husband, Maje Ayida bore a child with his long time lover.